FROGGY DOO is looking forward to the Annual Hollywood Awards Ceremonies for Best Frog in a Full-Length Feature Film. 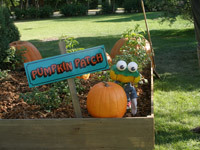 Follow Froggy Doo as he travels from adventure to adventure… from the Pumpkin Patch where he plays with his friends to co-starring in a movie. Happy Herb and Froggy Doo invite you to watch for the movie A Plumm Summer to be released in 2008, based on the kidnapping of the rascal marionette Froggy Doo. 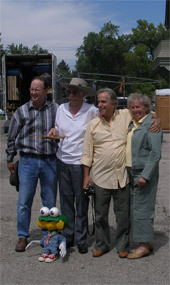 The movie stars, of course, Mr. Froggy Doo and his Hollywood pal Henry Winkler who plays Happy Herb McAllister. PICTURED TOP RIGHT: Stan, Herb, Henry, and Janet. BELOW: Herb, Henry and screenwriter T.J. Lynch. BOTTOM RIGHT: Brenda Strong and Herb.